Rent The 40/40 Club | Corporate Events | Wedding Locations, Event Spaces and Party Venues. 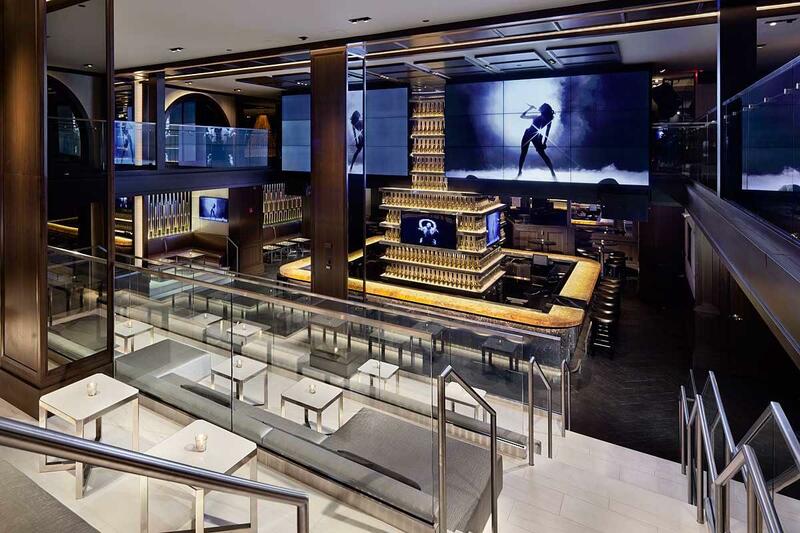 The 40/40 CLUB is an all-American sports bar and lounge owned by hip hop mogul Jay-Z and partner Juan Perez. It combines the lavish warmth of a New York City penthouse with the vivacity and glamour of court-side seats at a championship game, not to mention it's top notch menu. The 40/40 CLUB, an all-American sports bar and lounge owned by hip hop mogul Jay-Z and partner Juan Perez, opened its doors to the public on June 18, 2003. Created by the longtime friends, the club is 12,000 square feet of pure sports and entertainment in an opulent lounge setting that combines the lavish warmth of a New York City penthouse with the vivacity and glamour of court-side seats at a championship game. The decor is a mix of memorabilia from this country’s greatest games coupled with Manhattan sophistication. The “Hall of Fame” connects the main floor with the upstairs VIP rooms and houses autographed jerseys donated by various celebrities. There are 5 VIP Lounges available on the second floor of the club. The largest of the VIP lounges, the Jay Z Lounge features two areas of luxurious bespoke lounge seating that encircle a custom billiard table, six HD televisions, oak paneling with silver leaf detailing, and stately wood floors. An infinity mirror style sports display case holds a valuable collection of one-of‐a‐kind sports memorabilia. The Jay Z Lounge can accommodate up to 100 guests. Two of the lounges, the Elit Lounge and the Corzo Lounge are fully equipped with luxurious seating encircling a custom billiard table, 2 55in screen HD televisions, oak paneling with silver leaf detailing, and herringbone wood floors. Both rooms come fully equipped with state-of-the-art independent audio and visual systems including an iPod dock. Both the Elit Lounge the Corzo Lounge hold up to 40 guests. The Player’s Lounge is our most intimate VIP room suited for smaller gatherings. It features cozy and elegant lounge seating, two flat screen HD televisions, oak paneled walls and herringbone wood floors to create its stylish ambiance. The Player's Lounge can accommodate up to 20 guests. Executive Chef, and Jay-Z’s personal chef, Mike Shand created a new menu that is sure to please both the sports fan and the casual diner. Guests will be enticed by the upscale traditional American sports bar cuisine, done with a twist. Current menu selections include traditional Buffalo wings, our famous 40/40 club sliders served with our own signature 40/40 sauce, mouth-watering sandwiches and salads, as well as a variety of entrée items and a mix of tasty mini desserts including house-made Bannoffe pie & our warm Pineapple Upside down cake.